Welcome to Kaiteriteri Beach in the Tasman region of New Zealand. 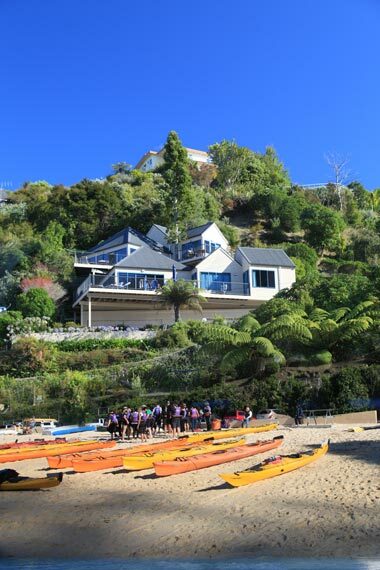 Kaiteriteri offers you a delightful haven for relaxing and a central location from which the diverse beauty of the Nelson and Tasman regions can be explored. Your holiday accommodation sits on the hill looking out over this beautiful sheltered bay near the entrance to the Abel Tasman National Park. Wake to golden sands, blue green waters and the highest sunshine hours in New Zealand. Please check the calendar below and then either email us your required dates or send a booking enquiry for these lovely Kaiteriteri self-contained holiday apartments on the form here.